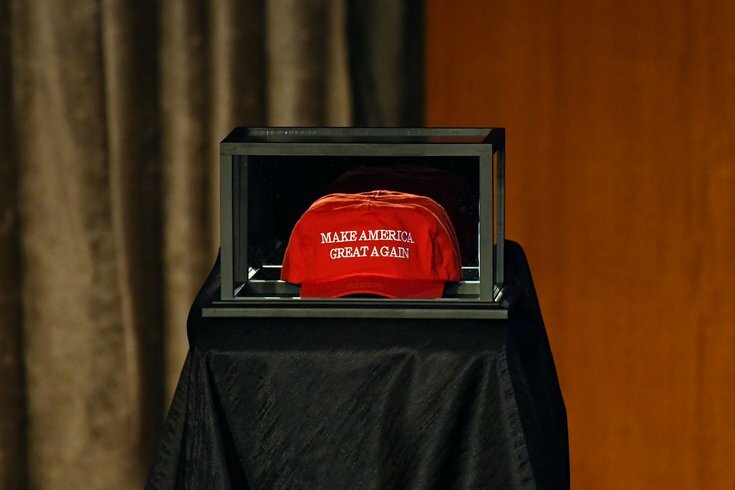 A Make America Great Again hat is placed on the side of the stage prior to Republican Party candidate Donald Trump speaking to supporters at New York Hilton Midtown on election night. No shoes, no shirt, no service. Oh, and no MAGA hat, either. A New York City judge on Wednesday tossed a lawsuit from a Philadelphia accountant who alleged a Manhattan bar refused him service because he was wearing a President Donald Trump "Make America Great Again" hat. Gregory Piatek, 31, sued The Happiest Hour last year, claiming that after visiting the 9/11 Memorial Museum, he visited the watering hole but was ignored by the staff, according to PhillyMag. Piatek alleged that while he was sitting at the bar, no one came to serve him while groups on either side of his group at the bar were taken care of. When he asked the bartender if they were ignoring him because of the hat, the bartender said yes, according to the suit. Lawyers for Piatek argued he had been denied service because he refused to take the hat off and held true to his "spiritual belief," claiming the bar discriminated against him based on his creed, the New York Daily News reported. But lawyers for The Happiest Hour argued that creed refers to specific religious beliefs, not spiritual feelings about politics, noting that law doesn't protect political affiliations under anti-discrimination statutes. Cohen sided with the bar, ruling that Piatek didn't establish a "faith-based principle to which the hat relates." He called the incident nothing more than a "petty” slight, according to the New York Post. In a statement issued after the judge's decision, the bar’s owner, Jon Neidich, claimed that Piatek wasn’t asked to leave because of his Trump hat, but because he was berating the staff. "At the Happiest Hour we firmly support womens’ rights, marriage equality, gun control, the environment, and regard for the truth- we don’t discriminate. What's gotten lost in this story is that the guest wasn't kicked out because he was wearing a Trump hat- he was asked to leave after being verbally abusive to our staff, which is something we don't tolerate regardless of who you are. And this is after he spent almost $200 - the 20% tip he left would seem to indicate he was satisfied with the service he received."